GREEN BAY — The Packers took a 21-10 lead into the fourth quarter of Sunday’s game against the Rams at Lambeau Field. Aaron Rodgers completed a 65-yard touchdown pass to James Jones just two minutes into the second half. It staked the Packers to a 21-10 lead, at a time when the Rams defense was beginning to settle into a groove. 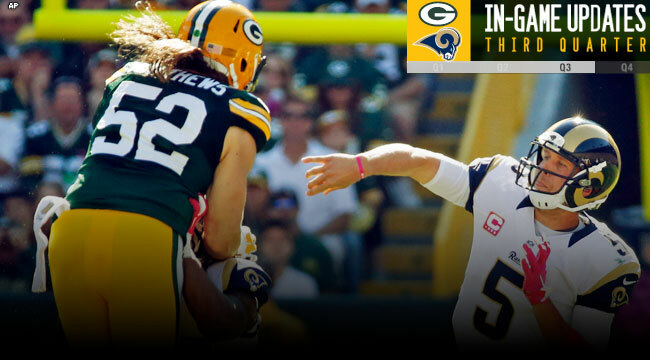 The Rams sprung a fake punt on the Packers for a 20-yard, drive-sustaining pass completion at the Packers 37. Again, the Packers defense said no, forcing a 50-yard field goal attempt, which was partially blocked by Datone Jones. The Packers offense took possession at its 40. Three plays later, however, the Rams’ Robert Quinn knocked the ball out of Rodgers’ hand and Lamarcus Joyner recovered at the Packers 41. A 53-yard field goal attempt was the best the Rams could do; it failed.